Azure vs AWS: Is Azure all talk or can it walk the walk? When it comes to public cloud, can you actually avoid vendor lock-in? AWS is the big dog on campus, but the competition is starting to get serious. Azure is comparing itself to AWS, but is this an accurate comparison? 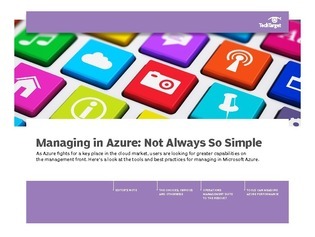 Azure needs to prove itself just as capable with equally uncomplicated management. This e-guide contains articles from three vendor-neutral experts, breaking down the products that claim to improve Azure-users quality of life. See whether it really stacks up as a legitimate public cloud alternative, an equal, to AWS.